Anna Bolton | Greene County News Joyce Brown, human trafficking survivor; Beth Bullock, advocacy director for R.E.A.C.H. for Tomorrow; Amy Willmann, executive director for Safe Harbor House and Ohio Faith Net’s Greg Delaney speak to a room full of people Aug. 27 at Emmanuel Baptist Church in Bellbrook. BELLBROOK — He lured her away from her Columbus home when she was 15. He showed her alcohol, drugs. He asked her to “watch his back” when he shoplifted. Then he left her with a pimp. That’s where her life on the street began. She stayed for 30 years. Once a victim of human trafficking, Joyce Brown now works in Springfield helping other survivors like her. She also tells her story across Ohio, and relived it to a room full of people at Bellbrook’s Emmanuel Baptist Church on Aug. 27. 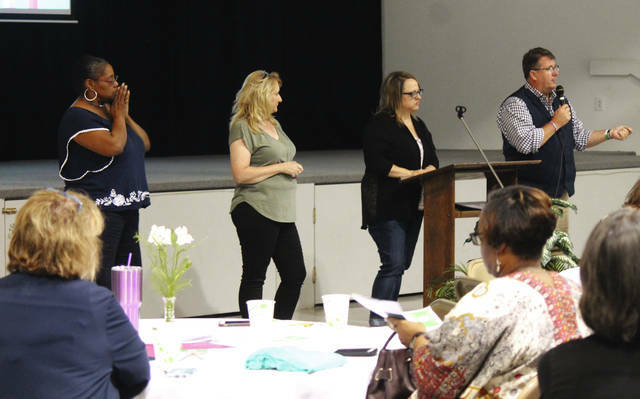 The “Hidden in Plain Sight” educational forum, hosted by Ohio Faith Net, partner to the Attorney General’s Human Trafficking Commission, aimed to educate church leaders and community members on human trafficking and give them ways to reach out to victims. She recalled the time when he left her with a pimp for the first time. “I didn’t know what to do … because at that time I was hooked on alcohol, I was estranged from my family, and I was lost,” Brown said. While suffering from homelessness and addiction, jail became a familiar, safe place, Brown explained to the people in front of her. “Once I started doing drugs … I started going to jail. Jail was a place to stay … It was a safe haven because I wasn’t laying down somewhere where I had to keep one eye open … ” she said. Brown’s experience and the help she received led her to her current work supporting women facing similar challenges. Her survival started with a little hope, she explained. Five years ago she turned her life around, quitting alcohol and drugs, and reuniting with children she had given up. “God is so good. He’s so good,” Brown told the crowd more than once. Her story isn’t so different from other Ohioans’ stories. In 2017, 1,133 Ohio calls were received on the national human trafficking hotline and 365 human trafficking cases were reported in Ohio, Beth Bullock, advocacy director at R.E.A.C.H. for Tomorrow, said. If you are a victim of human trafficking or suspect an incident, call the hotline at 1-888-373-7888, text HELP or INFO to 233733 or visit humantraffickinghotline.org. The educational forum will continue 6-8:30 p.m. Monday, Sept. 10 at Bellbrook United Methodist Church, 47 East Franklin Street. The event featuring two breakout sessions is free, open to the public, non-denomination and non-partisan. Call event host Susan Lopez, Family Resource Center, at 937-848-3810 for more information. To learn more about human trafficking and how you can help victims, see second part of this story in tomorrow’s paper. https://www.fairborndailyherald.com/wp-content/uploads/sites/50/2018/09/web1_Speakers.jpgAnna Bolton | Greene County News Joyce Brown, human trafficking survivor; Beth Bullock, advocacy director for R.E.A.C.H. for Tomorrow; Amy Willmann, executive director for Safe Harbor House and Ohio Faith Net’s Greg Delaney speak to a room full of people Aug. 27 at Emmanuel Baptist Church in Bellbrook.